Before starting, reset your router. If you see a message about "Default configuration" press Remove configuration. You need to setup your Mikrotik router by using Winbox. 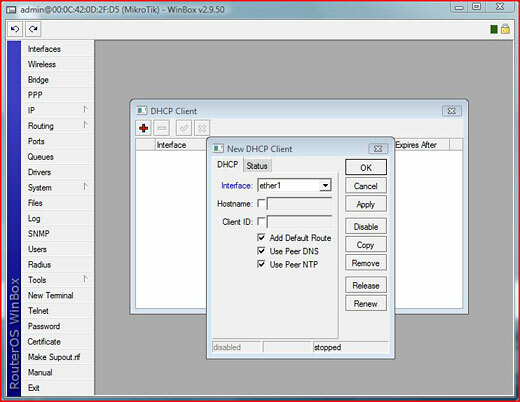 Winbox is the graphical user interface for configuring the Mikrotik Router OS. You can get Winbox from Mikrotik's website. 1. 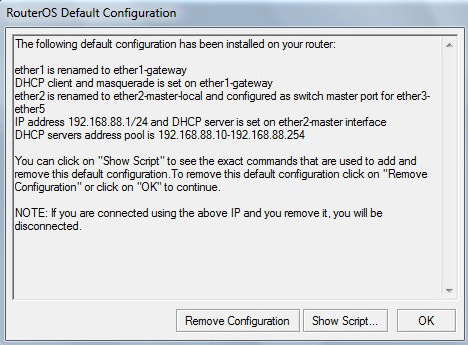 First we need to define the first port for WAN connection so the router will connect to the internet via another router with DHCP. 2. 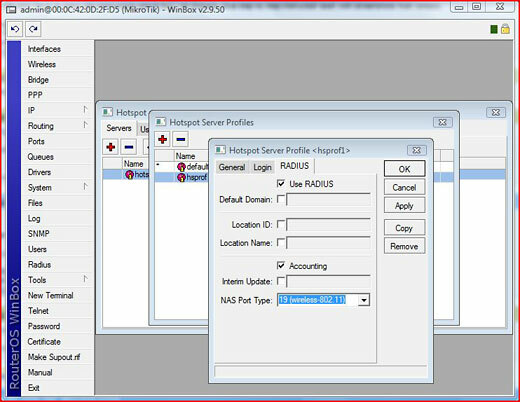 Let's add the hotspot service to wlan Click IP > HotSpot and the hotspot Setup box, choose wlan1 as hotspot interface. You can accept default values but choose none for certificate. Leave the IP as it is (10.5.50.x). If you change this IP, the LOGIN and LOGOUT links will not work on your splash page. 3. 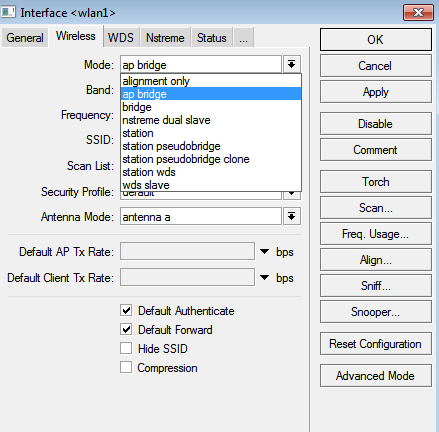 The router should be placed in ap bridge mode. And make sure the frequency is set to 2.4 b/G. 4. You need to add our radius server as authentication and accounting server. 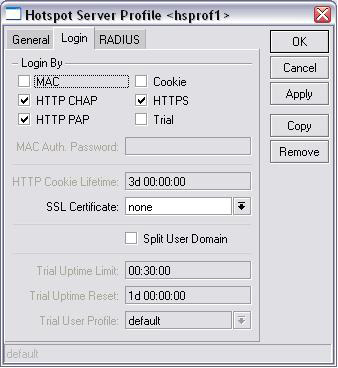 In the hotspot profiles (IP > HotSpot > Profiles) choose your hotspot profile and click the radius tab, check allow radius. 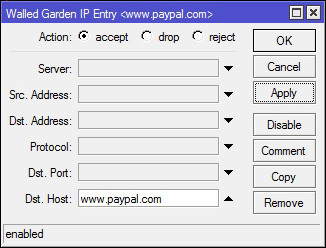 Then click the login tab and de-select cookie, allow https, http pap and chap. 5. You need to define our radius server. Click Radius and the + sign to add our radius server. 6. You need to add the secondary radius server. Click Radius and the + sign. 7. We have to allow certain sites and servers for non authenticated users otherwise they can't buy access. For Hotspot FREE SOCIAL locations: you need to add several domains/hosts to the allowed field in order to allow users to log in to there favorite social site. Please follow this article to add these domains/hosts to the whitelist. 8. You need to syncronize the router's time with our server. Click on System > NTP Client. Enter primary and secondary NTP servers. To find NTP servers, go to http://www.pool.ntp.org/ and select the location's continent on the right side of the page. You'll find NTP servers there. 9. You need to change the router's NASID. The NASID setting in the Mikrotik is located under System > Identity. Default is 'MikroTik'. NOTE: In case you are installing multiple routers in the same location, you should use different NAS IDs. For the second routers you need to add '_wds_1' to the NAS Id, for the third router '_wds_2', etc. So for example if you want to install the second router in location 3, the NASID should be set to 'globalhotspot_3_wds_1'. 10. 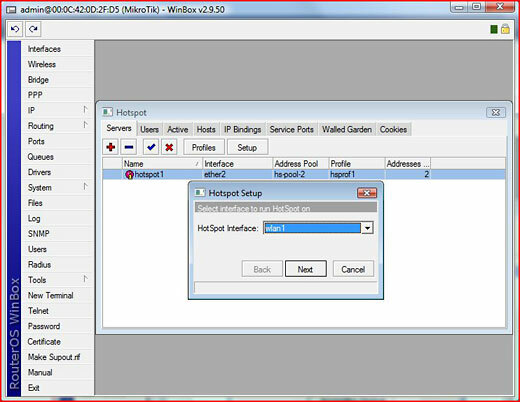 You have to customize Mikrotik's built-in hotspot pages. On the side menu go to Files, and find these files under the 'hotspot' directory. Unzip the downloaded files and drag and drop them to your "hotspot" directory in the Winbox program. Be sure to move the cursor under the hotspot directory. 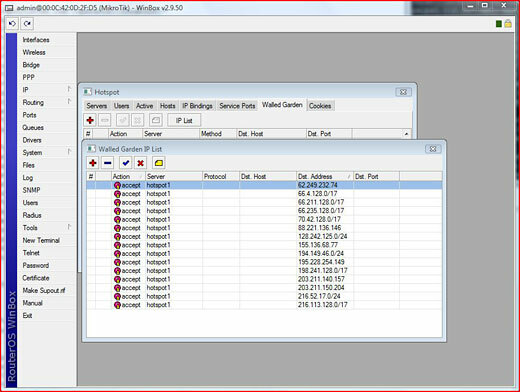 If you wish to use FTP you can FTP to your mikrotik router with the admin userid and password and replace the file there under the 'hotspot' directory. 11. You have to set the Login/Logout URL IP addresses in the Control Center. Log in to the Control Center with your Operator Username and password and go to Manage > Locations. Click on the location, then click on Modify Hotspot Data & Settings. 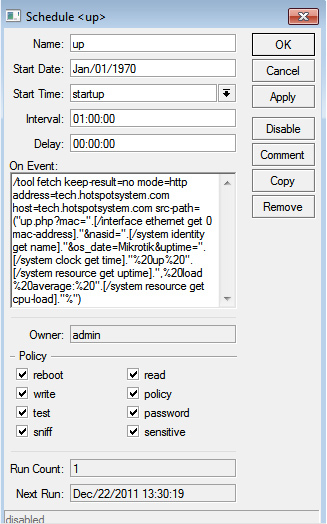 In Splash Page Settings modify the Internal Login/Logout URL Set to Mikrotik. Make sure that 'Display Login Box on Main Splash Page' option is CHECKED. 12. Extend the shared-users limit in your hotspot profile. 13. 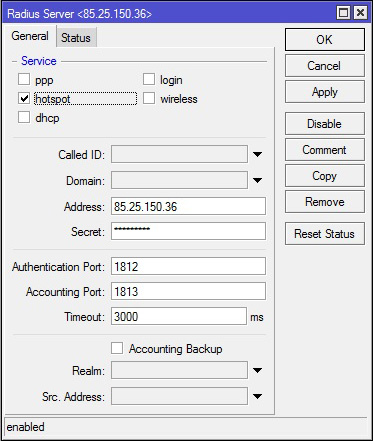 As the last step you have to add hourly checking for up status for the Router Alert feature. That's all. You can setup hotspot service even on a wired connection. In this case you have to choose an ethernet port instead of wlan or you can setup hotspot on both ports. 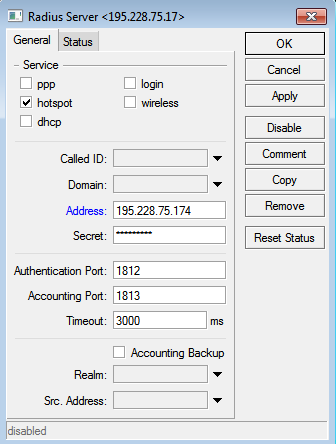 If you have successfully setup your mikrotik router you have to see a login window when connecting via wireless. You can log in with username admin, blank password. Should you have any more questions or problems, please read our Knowledgebase or contact Help Desk.